Yet another excellent Mid War neutral event, though its capacity for DEFCON suicide keeps it a tier below ABM Treaty / Junta / Brush War / SALT Negotiations. When I draw it, I will usually headline it whenever possible. 1. You are forced to trigger an unfavorable event. Aside from DEFCON suicide, it is also possible (though extremely rare) that the event you pull with Missile Envy is harmful to you. For instance, Nuclear Test Ban might raise DEFCON at a point when you want to lower it. In general, as long as either We Will Bury You (for USSR) or Duck and Cover/Soviets Shoot Down KAL-007 (for US) are out of the game, then I don’t worry about the possibility of losing the game via Missile Envy, especially in the headline, and especially if I’m the US (since the USSR rarely lowers DEFCON in headline). 2. You are forced to trigger a meaningless event. The second-worst possible outcome. More commonly happens to the US: US/Japan Defense Pact and NATO are the best examples. Arms Race is often a wash as well. This rarely happens to the USSR as its high Ops events are almost always useful. Even in this situation, I still consider Missile Envy a net plus, since you’ve eliminated a high Ops card from your opponent’s hand. 3. You trigger a event good for you. Generally the second-best possible outcome, depending on how good the event is. Most of the really good events have high Ops, and so the possibilities range from Red Scare/Purge, ABM Treaty, Muslim Revolution, or Marshall Plan, to Brezhnev Doctrine, Bear Trap, Ussuri River Skirmish, or OPEC. Of course, maybe you trigger something that is only speculatively helpful, like Flower Power, but in general, your high Ops events are good to trigger in exchange for 2 Ops. 4. You get to conduct Operations. I consider this generally the best possible outcome. Not only can you conduct operations in the headline, but you’ve also eliminated a high Ops event (a potentially powerful opponent’s event) from your opponent’s hand. Taking Muslim Revolution and turning it into a no-strings-attached 4 Ops US coup is a gamechanger. The second half of Missile Envy is usually just as strong: the fact that you force your opponent into a 2 Ops play on AR1 is very exploitable. For example, as US, when you headline Missile Envy, the USSR is now forced to either coup with a 2 Ops or let you coup. Not a big deal if he’s couping Zaire, but a real discomfort if he was counting on a big coup to get into South America. Conversely, the USSR can headline Missile Envy then make an AR1 play for a battleground knowing that the US response can only be 2 Ops. In general I do not use Missile Envy during the middle of the turn, first because DEFCON is already 2 (furthering the risk of nuclear suicide), and second because the opponent will have already used high Ops cards, and I’m no longer assured of a 3 or 4 Ops card. Missile Envy may combo well if you know your opponent’s hand already (i.e., you headlined CIA Created or Lone Gunman), since you can have an idea of what you will be getting. This entry was posted in Mid War, Neutral Events and tagged missile envy. Bookmark the permalink. What happens if one player plays Missle Envy and the other player only has scoring cards plus 1 hold card left? Do you win by DEFCON? Ex: USSR plays Missle Envy on AR7. US is holding Europe Scoring and, say, Five Year Plan. The US must give the USSR Five Year Plan, and receives Missle Envy in return. The USSR player conducts OPs normally with Five Year Plan. On the US’s AR7, they must use Missle Envy for OPs (following the text of the event), and therefore must hold Europe Scoring, causing them to lose the game. Missile Envy can’t lose you the game like that. In such situations you must play the scoring card, and then Missile Envy at your next opportunity. See rule 10.1.5. Pulled off a nice combo with this once as the U.S., after HL’ing CIA, such that I knew that my opponent was holding “Ask Not…”. I waited until he played US/Japan, then played Missile Envy on the next AR to get rid of some terrible cards (one of which being Lone Gunman). On the other hand, I’ve been burned with this card a few times (not DEFCON losses, but results 1 and 2 above), and I once had an opponent that lost on Nuclear War with it, so I’m pretty careful about HL’ing it. 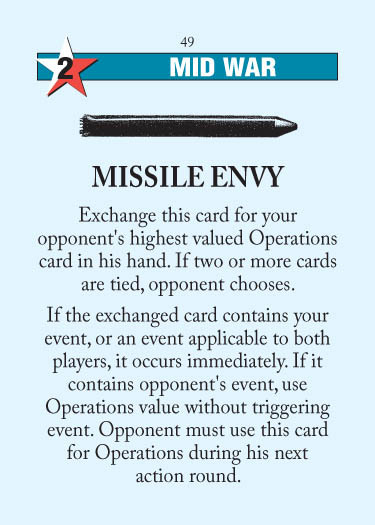 I need some rules clarifications about interacting Missile Envy with some other cards. 1. What if I’m under Red Scare/Purge, my opponent plays Missile Envy as event and I have only 1OP and 2OPs cards? They’re all 1OP cards from my point of view so can I choose any of them or do I have to choose one of the literally 2OPs cards? 2. Same question about situation when I have only 4OPs cards and 3OPs cards strengthened by Contamination/Brezhnev Doctrine. 3. What happens if I play Missile Envy as an event and get UN Intervention in return when I have no opponent events in my hand? 4. USSR headlines Missile Envy but in AR1 plays “Ask Not…”. Can USA get rid of Missile Envy or does he have to leave it on his hand to play it for ops during his AR1? 5. What exactly happens when Missile Envy is played as an event against a Quagmired/Bear-Trapped player? 1. You can choose any of them, all those 2op cards are considered 1op. 2. Same logic as 1. 3. UN intervention has no effect if you can’t play another opponent event together. 4. I believe the US can get rid of Missile Envy without bearing its curse. 5. The Quagmired/Bear Trapped player must play Missile Envy as his discard card.in the next AR, given he is not also Red Scared/Purged. If he is also purged, there is no official answer to whether he could use another card to get out of Quagmire/Bear Trap or not, but I personally think the answer should be “No”. 1. It seems that Red Scaring/Purging opponent gives him some benefit in certain situation which seems illogic. 3. I believed UN Intervention cannot be played just as an empty event, it is allowed to be played either for OPs or as a normal event. Otherwise I see no sense in forbidding headlining it as an empty event. I thought UN Intervention should rather be forbidden to be given in return to Missile Envy. 4. Thanks, I believed so too but wasn’t sure. 5. So what do you personally think about a Quagmired/Bear-Trapped and Red Scared/Purged player who has been played Missile Envy against? What does he have to do? Pass, even if he has some cards which are expensive enough? Play Missile Envy for OPs, ignoring Quagmire/Bear-Trap for one round? I still don’t know. 1. I am farily sure it works like this. 3. UN intervention cannot be played as a empty event, this is true. However in your case, it has already been pulled by ME, it is treated as an event that couldn’t occur, similar to NATO prior to Marshall Plan/Warsaw Pact or Socialst Government after Iron Lady. Also, forbidding UN Intervention in headline phase is mainly designed to prevent using it for perform 4op action in headline phase. 5. I personally believe if a Quagmired/Bear Trapped and Red Scared player who just got ME curse will probably have to stay there doing nothing (except play scoring card) for the rest of his turn. I actually think we had situation 5 in a recent game. We agreed that the Quagmired/BT’d player *would* be allowed to play a different card. I’m pretty sure we based this on something we read online somewhere. In the case of 3, there’s no official ruling, but I reckon nothing happens (ie. UN Intervention is passed across and has no effect), as there’s no rule that I’m aware of that says otherwise. Seriously unlikely however. I’d like to point out a nice side effect of playing Missile Envy on your opponent that has occurred in a few of my games. When you play it can give you a very good idea of the op strength of your opponents hand. For example if you draw a 3op event from your opponent after headlining Missile Envy you know for certain that they have no 4op cards and also that they are down one of their 3op ones. This can make certain card plays such as Blockade or Latin America Debt Crisis more effective or the success chance of an op war a lot higher. Even better if you headlined it or played it later in the turn (DEFCON risky) and got a 2op or 1op then you know what they have left is rubbish and can really start to pile the pressure on them. This makes flipping Battlegrounds simple when you have a high op hand or perhaps the China Card as they just won’t be able to respond. Not quite as good as seeing your opponents hand but I’ve used it to a great advantage a few times as well as suffered from my opponents use of it immensely. Can I use Missel Envy as opening card? Be careful, this can also save your opponent from a DEFCON suicide. Played this on my opponent last night when he was holding Grain Sales with no way to discard or hold. Luckily my opponent didn’t notice and gave me a different three opp. Oops I mean Duck and Cover was the three ops. What if i am under red scare/purge and play missile envy. How many OPs do i get from cards with opponent events? I have read from bgg forum that the drawn card is also affected by RS/P which is not my intuition and not how it is implemented in the vassal module. Had a hilarious occurrence today playing as U.S.A., I headlined “grain sales to Soviets” and pulled “Cuban missile crisis”, which I triggered for the event. The Soviet player headlined “missile envy” and pulled “we will bury you!” And as a result buried himself and lost the game! What happens if the highest card of my opponent is the China card? Am i allowed to use the China card for OPs or does nothing happen as the China card has no event (except on final scoring)? China Card doesn’t count towards Missile Envy. If it’s getting later in the Mid War and Missile Envy hasn’t yet appeared, I am probably going to headline ABM Treaty if it appears in my hand, unless I have a reasonable alternative 4 op card ME could pick up instead. Losing ABM to your opponent is such an enormous swing that you want to dodge the risk. Headlining Missile Envy is never safe… my opponent (USSR) tried at Defcon 4 to do so. My headline was Cuban Missile Crisis, and then his jaw dropped as I buried him with We Will Bury You. It could be safe if you can see your opponents headline ahead of time. The other day as USSR I headlined Missle Envy with strong board position at -11VP. Seemed safe because Duck and Cover and Cuban Missle crisis were accounted for, so WWBY shouldn’t be a problem. My opponent headlines Five-Year Plan, randomly pulls GRAIN SALES from my hand (1 in 8 chance), coups, throws out WWBY, boom game over. GAH! He could degrade with Junta, too. Say the US plays Missile Envy on their last Action Round. I headline Missile Envy as USSR and pull Aldrich Ames… if I discard Missile Envy from the US hand, does she have to skip AR1, or just play whatever she likes? An odd sequence not covered under the rules. I would just allow the US to play whatever.